Is it possible that art has the power to heal? Could it be that the sacred monuments, paintings and sculptures from ancient civilizations around the world were created to evoke more than just beauty alone? Do they also have the power to heal us? 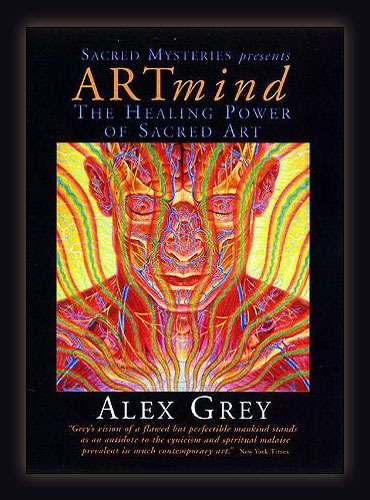 During the course of this video, which includes scores of his paintings and sculptures going back over twenty years of creation, Grey discusses the power of Sacred Art to bring us face to face with divine reality. After describing the life experiences, sacred teachings and painters that have inspired his own artistic vision, he takes us on a whirlwind tour of the Sacred Art of spiritual traditions from around the world, demonstrating to us how these works of art have been used in the past and can be used today to revitalize our health and sense of well-being and discover our divine potential. 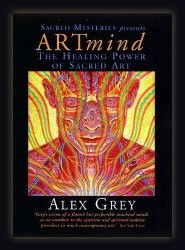 "Alex Grey is making some of the most beautifully refined imagist work in the country today." "Grey's vision of a flawed but perfectible mankind stands as an antidote to the cynicism and spiritual malaise prevalent in much contemporary art." "Alex's work, like all great transcendental art, is not merely symbolic or imaginary; it is a direct invitation to recognize and realize a deeper dimension of our very being." "This is a remarkable 79 minutes. It succeeds in illuminating Grey's methods and motivations for portraying or revealing dimensions of life beyond the three normally employed in visual art"